Image Comics is launching a new crime procedural comic this April, but here’s the thing—it’s a high fantasy book and one of the protagonists is a cat-man, or something. The book is called Fairlady, and the creative team is writer Brian Schirmer, artist Claudia Balboni, and colorist Marissa Louise. In a press release announcing the title, a long list of the influences were cited, including the old Vertigo series Fables, the more recent Image series Rat Queens, Conan the Barbarian, the work of Mike Mignola, and ‘70s and ‘80s network TV shows The Rockford Files and Magnum P.I….you know, that old predictable group (kidding obviously, that list is eclectic as all get out). The plot of the book sees Jenner Faulds posing as a man to join the army before returning to her home to become an investigator. Due to the same sexism that got her ousted from the army, Faulds is left working cases nobody else wants. The debut and subsequent issues will all be 30 pages. The first issue is due out April 10. 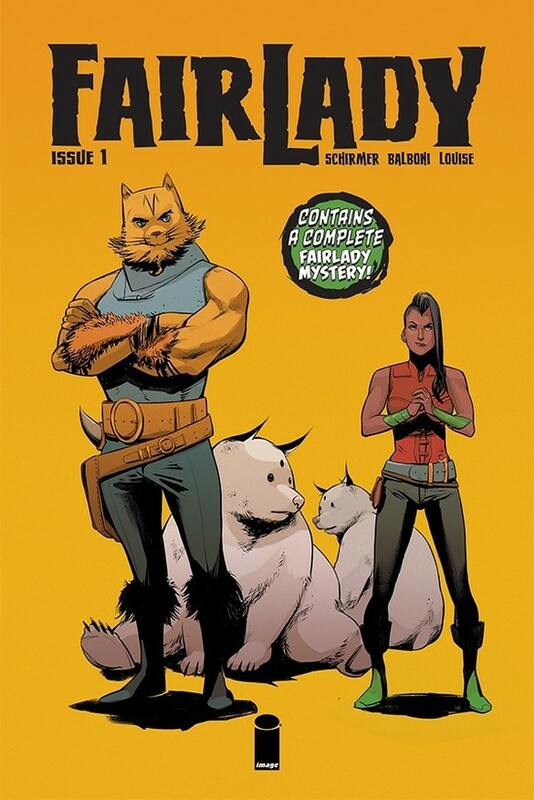 Writer Brian Schirmer, artist Claudia Balboni (Star Trek), and colorist Marissa Louise team up for Fairlady—an all-new fantasy series from Image Comics this April. In Fairlady, after posing as a man to join the army, Jenner Faulds returns home to The Feld for a new start as a “Fairman”—a specially licensed private investigator. But sexism didn’t end on the battlefield, and as the only “Fairlady,” Jenner gets stuck with the cases nobody else wants. Hitting the streets to solve The Feld’s overlooked mysteries, Jenner finds that the smallest cases hide the biggest secrets. Fairlady blends the procedural case-solving of Magnum, P.I. and Fables, but is set in a vibrant, Rat Queens-like high fantasy world. This debut issue and each following issue will feature a complete 30-page story. Fairlady #1 Cover A by Balboni and Louise (Diamond Code FEB190020) and Fairlady #1 Cover B by Tula Lotay (Diamond Code FEB190021) will be available on Wednesday, April 10. The final order cutoff deadline for comics retailers is Monday, March 18. Fairlady #1 will also be available for purchase across many digital platforms, including the official Image Comics iOS app,Amazon Kindle, Apple Books,comiXology, and Google Play. This looks right up my alley. I’m in! Looks promising! Added to my Pull-List.